In the early 1720s the Dunfermline kirk session consisted of the two ministers and 25 elders who were subject each year to ‘privy censure’ to ensure they were ‘circumspect in their walk and conversation’. The elders were responsible for taking the collection on Sundays, accepting or giving testimonials of good behaviour from people coming or going, relief of the poor and Sabbath visiting. This last to ensure that no-one was drinking or carrying out household tasks or other activities when they should have been at church. The ‘elders at the plate’ were regarded with some awe but in 1726 two of them, Robert Couston and Robert Ferguson, fell from grace. With Robert Couston it was drink. On November 20th 1726 it was reported to the kirk session that Robert Couston, one of their number, was scandalously drunk at Wednesday’s market. When Robert was questioned he acknowledged that he had been somewhat mistaken with drink that day but denied reports that he had also been fighting and rankling (wrangling). On December 7th several elders reported that they had heard that on market day after daylight was gone, Robert had been in a public change house (inn) in the town and that he was not only mistaken with drink but was offensively kissing both men and women. Robert admitted that he ‘kisst a young woman who might become his good-daughter’ (daughter in law) and that he also ‘kisst William Stenhouse, the Laird of Fod’s son’, but did not remember if he kissed them oftener than once. From the change house Robert had gone out of the town to the Entry (near Pitreavie) and drank a chapin of ale with Andrew Smith and created such a noise that people asked what the matter was, only to be told that it was ‘Robert Couston who was come out of the Town drunk’. 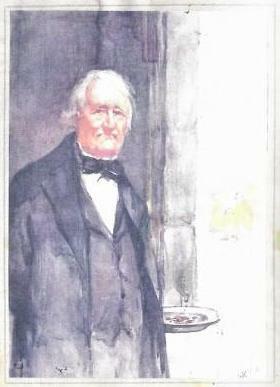 The session recognised that he was ‘an habitual drinker often mistaken with drink and causing offence’ and, despite his service of more than 10 years and his claiming that he had reformed, they voted ‘to displace the said Robert Couston from the office of an Elder in this Congregation’. If the Robert Couston affair was soon over, the same could not be said for the case of Robert Ferguson, who had also been an elder for many years. With Robert Ferguson, a brewer and a married man, the problem was women. On March 3rd 1726 Mary Finlayson, a single girl, who had been Ferguson’s servatrix, came from Logy (probably Logie, Stirling) and craved a testimonial from session for the time she had lived in Dunfermline but, as she had left under a cloud, was said to drink heavily and to be loose in her behaviour, and may have been pregnant, session wanted to make enquiries first. On March 23rd session questioned Mary about her drinking and her relationships with men particularly John Aicken who had accompanied her to Logy. Mary denied all accusations. Fourteen witnesses had been summoned and although other men are mentioned, Robert Ferguson was always hovering in the background. The first witness Andrew Chrystie at Lady’s Mill, who had been Mary’s master after Ferguson, said that he had dismissed her because she used to go out in the evening, returning drunk and incapable of work. Other witnesses testified that Mary drank a good deal particularly at the house of James Stewart, weaver at the Damhead, in the company of Robert Ferguson and his new servant, Katharine Campbell. Another witness, Margaret Adam, said she had seen Mary Finlayson and Katharine Campbell in Robert’s fire room dancing to the music of Archibald Cameron, violer, in the company of Ferguson, John Aicken, and others, and when they were in her house on Handsel Tuesday, Robert and Mary got up to leave and Robert was cross with her when she told him it was wrong. John Runnan, tailor, a nephew of Robert’s wife, said that once, Mary was so drunk she could not take in a load of coals but her master Robert Ferguson would not believe it of her until she was actually incapable of speech. Asked about her levity on Handsel Tuesday, he said that Robert asked him to let him know when Mary came to town so that he could speak to her before John Aicken did, and when they all met at Margaret Adam’s that night Robert twice took Mary to the door but was stopped by Margaret who said it was ‘a shame and very undecent for him to take a woman out of the Company in that manner’. Robert came back and was intent on feeding the company and asked John to go to his house to ‘steal’ two fishes but not to let his wife know, but as she was John’s aunt he did tell her. How Robert got on when he went home to get a pie to share is not recorded! Another witness, Alexander Broun, weaver, had seen no indecency in Mary’s behaviour but said that she was sometimes the worse for drink and too easy in letting the lads kiss her. On April 3rd the clerk was ordered to write to the minister of Logy where Mary now resided to cite her to appear before the Dunfermline session and further witnesses. On April 5th John Aicken declared that at the request of Robert Ferguson and Margaret Adam he had accompanied Mary Finlayson west from Dunfermline to her parents’ house but although he had thought of marrying her himself there was no unseemly behaviour between them, and he had changed his mind about marriage when she was rumoured to be pregnant. He admitted dancing in Robert Ferguson’s house with Mary and with Katharine Campbell and was sorry for it. Session now questioned Mary about having been pregnant and having got rid of the child but she denied both accusations. John Lindsay, brewer, now gave damning evidence. He stated that at about Lambass (August 1st) last year he went into the dovecot and saw Robert Ferguson and Mary lying in an obscene posture together and he heard Mary say ‘Alas’ and saw Robert fastening his breaches. On this testimony and John Lindsay’s appealing to Mary she judicially acknowledged that she was guilty of uncleanness with Robert Ferguson upon that time and was dealt with by session to bring her to a sense of her sin. Another case now came to light in tandem with affair of Mary Finlayson. On April 4th 1726, Robert’s new servant, Katharine Campbell, was rumoured to be with child and about to leave town, and session thought fit that ‘trayal should be made by two midwifs’ and the magistrates applied to make sure she came before the session first. After the trial Katharine admitted that she was pregnant and named John Robison in Kenmure (Kenmore) as the father and said that the deed was committed ‘about 14 days after Martinmas (Nov. 11th) in the open fild a little bewest Pitencrief Bridge’ and elsewhere. Master Hamilton, minister of Kenmure, was to be contacted about John Robison. The moderator, Ralph Erskine, told session that Robert Ferguson had come to him that morning and acknowledged his sin of adultery with Katharine and session thought fit to go immediately to his house to question them. Katharine was convened before them and acknowledged her sin of adultery with Robert a little after Martinmas last and more than once after that. She declared that he was the father of her child and she was never guilty with John Robison nor did she ever see him in this place. Robert was called in and acknowledged his guilt with Katharine on December 18th but, asked about Mary Finlayson, ‘denyd that it came to actual guilt nor did he know her as a man knows a woman, being interrupted in the act’ (perhaps in the dovecot) but he still looked upon himself as guilty before God as if he had fully committed the sin. They were ‘gravely rebuked and seriously exorted to the Exercise of repentance’ and it was decided that the case, being one of adultery, was to go to presbytery (the next highest church court). Master Hamilton Minister of Kenmure (who may have been searching for the innocent John Robison) was to be informed of outcome. On April 10th the kirk session considered Robert Ferguson’s double adultery and ‘in view of the heinousness of the sin’ unanimously deposed him from his office of Elder. On May 29th he appeared on the stool before the congregation for the first time. On June 9th session decided that Katharine should appear Sabbath next ‘because of some circumstances peculiar to the woman’ (probably her pregnancy) and, as the man and woman did not generally appear on the repentance stool together, Robert’s further appearances were postponed. In August after seven times on the stool, Katharine asked to be absolved but session found her ignorant and lacking repentance and ordered her to appear again. On September 1st Robert also petitioned to be absolved but session was not satisfied that he was truly repentant and he had to appear in public for the thirteenth time and to come before presbytery again. More was to come. In October 1726 rumours were abroad of scandalous behaviour between Robert Ferguson and yet another servant, Margaret Chrystie, who had come to Dunfermline from West Kirk parish, Edinburgh, in July. When cited, Margaret admitted only that ‘Robert kisst her three times when he was going from home’. Robert, who was apparently newly widowed, said that the reason for the rumour might be because he left her in charge of his home but he denied any unseemly behaviour. As usual witnesses were called. John Runnan, a previous witness, declared that the day after his aunt Jannet Runnan (probably Ferguson’s wife) was buried, he went to the house and Margaret told him that Robert was in his bed not very well and a day later that she thought she was with child to Ferguson and ‘doubted nothing but he would marry her’. Thomas Robertson, a former servant of Robert’s, whose bedroom lay immediately above his master’s, declared that he suspected Robert and Margaret were sometimes in bed together and one night he ‘heard such muttering and motion as made him suspect there was carnal dealing betwixt them’. William Broun, brewer, told session that one night when he was going down to the stable to give meat to his horse, he saw unseemly behaviour in the bedroom between Robert and Margaret, there being ‘a Candle on the board head before bed’. He added for good measure that he ‘thought several times that Margaret took too much upon her in the house, more than became a servant’. Session ordered Robert to put Margaret out of his house but on December 8th when she was still there he told them that he would have done so but his house was out of order and it would be some time before his ‘things were gathered together and his cloathes made clean and yt his cloathes are not yet dryed’ and his keeping her was ‘no wise out of contempt to the session’s orders but meer necessity’. The session decided to return ‘this complex case’ to the presbytery. Meanwhile, on March 4th 1727 Mary Finlayson had returned from Logy and asked session to allow her to appear before the congregation to absolve her from her scandal with Robert Ferguson. She confessed that guilt took place in Robert’s own millhouse where he attempted wickedness several times with her particularly on one Sabbath day when he cut a piece of muslin for her and he often promised to marry her when his wife was dead and to sell all he had to make money and go out of the country with her. Asked why she had not made such a full confession before, Mary said that Robert had forbidden it. Mary duly made nine appearances on the repentance stool and on May 7th was rebuked for the last time and dismissed. The case of Margaret Chrystie was still outstanding but on June 7th when Robert did not appear before presbytery as ordered it was reported that he had made his excuses to Master Erskine ‘in regard he was thronged with flitting and transporting his furniture to Edinburgh’, and on June 12th when he had still not come it was reported that Mr. James Wardlaw, the other minister, had received a line from Mr. Dalglish, Chirurgeon (surgeon) showing that Ferguson was ‘so troubled with Rheumatic pains’ that he could not attend. In August Robert appeared before presbytery who decided there was no actual guilt with Margaret just a presumption but there was unseemly behaviour which deserved public rebuke. Margaret was in Lothian for the harvest but on her return in September she was publicly rebuked and dismissed. Robert, having been summoned from his house in the West Kirk Parish of Edinburgh, had had enough. On August 17th he appeared before session asking if he could now be absolved as ‘he was so valetudinary (sickly) he doubted if he could ever return to this place’. Presbytery was consulted and remitted Robert to session ‘to be dealt with to bring him to a sense of his sin and the heinousness and aggravating circumstances yrof being laid to his conscience’. Finally, on September 24 1727 Robert Ferguson appeared on the stool before the Sabbath congregation ‘for his adultery with Katharine Campbell and Mary Finlayson and scandalous behaviour with Margaret Chrystie’ and was rebuked and dismissed. After 18 months, and page upon page in the minutes, the affair of Robert Ferguson was over. The story of the two Roberts shows that, like the ordinary mortals over whom they were set in judgement, elders of the kirk session could stray from the straight and narrow and from their exalted position be shown to have feet of clay. Note: Despite searching the available records I have been unable to uncover many personal details of the people involved in this story, although I imagine Robert Ferguson was middle-aged and the girls he seduced in their twenties. It appears that Mary Finlayson lost a baby, Margaret Chrystie may not have been pregnant and Katharine Campbell may have lost her baby or gone to Kenmore for the birth as there is no trace of her child in local records. The burial records for 1726 when Janet Runnan (who was probably Robert’s wife) died are missing. Robert Ferguson may be the man of that name who was a founder member of the Society of Gardeners in Dunfermline and lived at Garvock. 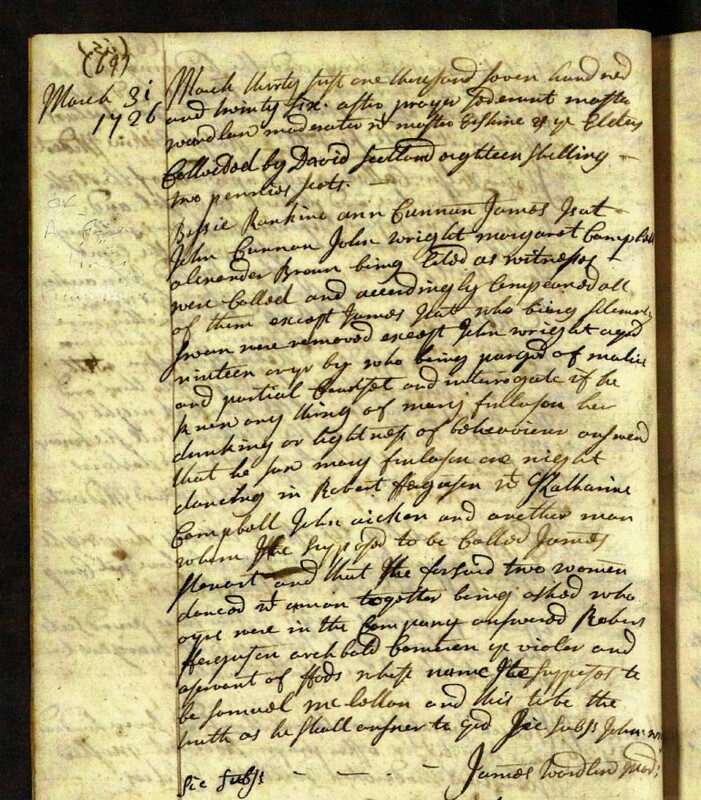 Dunfermline Kirk Session Minutes, Volume 4 (1716-1724) and Volume 5 (1725-1734), digitalised at the National Records of Scotland (NRS), Edinburgh as CH2/592/4 and CH2/592/5..
Dunfermline Presbytery Minutes, Volume 5 (1717-1729), NRS/CH2/105/5.